This entry was posted in #WIPpet Wednesday, ROW80, Writing samples and tagged #Row80, #WIPpet, sharing stories, Swan Song Series, writing. Bookmark the permalink. Thank you for talking about what inspires you to keep writing and what strategies you are using, despite those ‘life as normal’ upheavals that happen to us all. May you have the very best of holidays! Thank you, Beth. “Life as Normal”… when are things veer normal? 🙂 We just do the best as we can when we can. Everything that follows seems a bit out of place for this moment, as though it’s being fed to us so we’ll understand things we don’t yet. We don’t even know who the boys are – and we shouldn’t, not yet. Meanwhile, as we’re learning all this stuff we have no place to hang, ‘Tara is lying there with an arm that really hurts. I’d like a description of a consuming pain she fights to hide, and to know what her mother is going to do about it, because, as a mother, I’m not going to just stand by. Basically, while the musing she does is interesting, and might be really useful a bit later, her thinking all this now pulls me out of the story in progress – which is a girl who is so afraid of whatever’s in that barn that hurt someone she knew, and a mother who took her in anyway, and now a fall and a potentially serious injury. I’d be more hooked if we stayed with those immediate concerns right off, with only a couple hints seeded in that there was more to the story. What I want here is to FEEL the pain with her, her worry about crying, and her fear – is she more scared to be laying here where the whatever-they-are can get her? And hooray on the two months, the drawing, and the progress. Hugs for the season and all the things it means. You know me and my first drafts… I go meandering ALL over the place. So, yeah, all the thoughts and reasons and rationales show up. Hmm, how to show that even as hurt and scared as ‘Tara is, she’s almost even more scared of being sent away… I’ll be looking at it closer. Thank you for the wonderfully detailed input. Good reasons, and a clear sense of WHY it was slowing down for you, that it was still “interesting” but that it could be even more intriguing…. Again, thanks. A thought – could the fear of being sent away be brought out more in the opening paragraphs – before the fall. When she’s trying to get up her courage to go in, if she worries Mother will send her away for her fears, and tries to hide them? Seeding that concern ahead of her fall would allow it to be a very brief mention when she’s down, tasting, smelling, and feeling the muck on her face, the agony of the pain – and that fear of not being brave enough to stay with her mother – would be enough to get the point across without interrupting the flow of the action. I can see why it would emerge that way, and the value of the memory. I do think it would work better when she’s initially being encouraged to go inside, so that the seed is already there when she falls. Ooh, that’s interesting. Poor girl. I hope she learns that showing her emotions doesn’t make her less brave or less good. I hope so too, though… ‘Tara has some serious issues with her emotions for years to come. Hurrah for writing regularly! 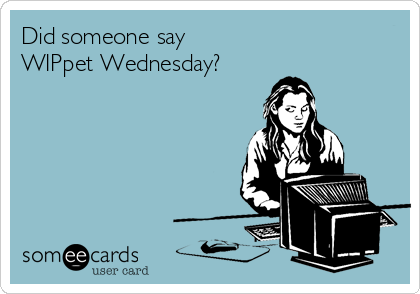 I’m actually taking two weeks off from WIPpet Wednesday because of the holidays. There’s too much to do, and I’ve two few spoons these days. I’ll be back next week. Having too few spoons seems to be a thing these days… not sure if it’s because we have so much more on our plate (we do) or spoons these days are smaller than they used to be. See you soon. I can relate to what you say about the holiday season and Life happening… Somehow it helps as I try to keep busy and therefore focus on my goals. Best wishes to you and yours. See you next round. Holidays have been meant as a way to upset routines and give people something else to think about instead of bone-weary ruts and frustrations… they do their jobs well, even if these days, more people are doing jobs they’ve chosen and love. I wonder if the purpose of holidays will change as that trend increases. Or… given the present political trends, will we start needing them more again? I was more thinking of my Flicker acct, but yeah, Instagram is good for some of the out & about bits.